In stock -This product will ship today if ordered within the next 10 hours and 54 minutes. 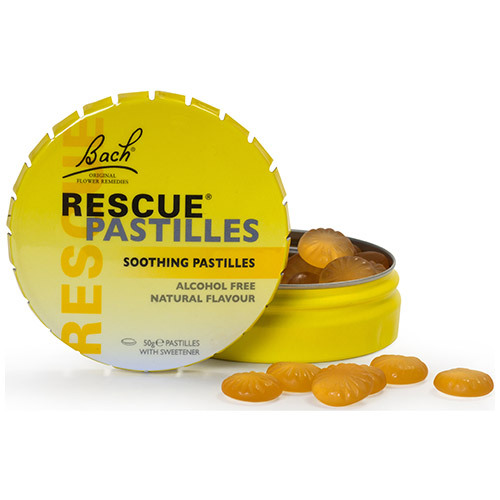 RESCUE® Pastilles are alcohol and sugar free. Each soothing orange & elderflower flavoured pastille contains four drops of RESCUE® flower essences. The handy click shut tin makes it the perfect travel companion to grab and go. RESCUE­® flower essences are the famous combination of 5 flower essences developed by Dr. Bach, who discovered a system of 38 flower essences that help you to stay on top of things. Bach RESCUE® is a combination of five individual flower essences for emotional wellbeing and care for everyday life. Keep cool, calm and collected with Bach RESCUE® remedies by your side. Bulking agents (sorbitol, maltitol, isomalt), gelling agent (gum arabic), natural flavouring (elderflower, orange) sweetener (xylitol), glazing agent (palm kernel oil, beeswax), flower essences (Helianthemum nummularium, Clematis vitalba, Impatiens glandulifera, Prunus cerasifera, Ornithogalum umbellatum [RESCUE®]). Chew one pastille as required. Below are reviews of Bach RESCUE Pastilles - Orange & Elderflower - 50g by bodykind customers. If you have tried this product we'd love to hear what you think so please leave a review.